We love opportunities to help insurance agents avoid unnecessary woes with workers’ comp shopping. No matter the size of the client. Last week we spoke with an insurance agent who does not work in the work comp industry, but had a client who now needed coverage for comp. His client had been with him for many years and because of this, the agent was a bit weary of having his client shop around by himself and being prospected for other aspects of his insurance at the same time. His client is a small business. The kind of small business where no one stood to earn any real commission off of their policy. However our policy is to do our best to help all businesses no matter how big or small. After a brief phone consultation with the agent, we got underway searching for the best policy that would fit his client’s needs. A couple of calls, emails, and clicks later to our markets, we were able to find solution which worked out for his client. At Simple Work Comp we value our relationships with our insurance agents, because without them and our good relationships, we would have no real business. 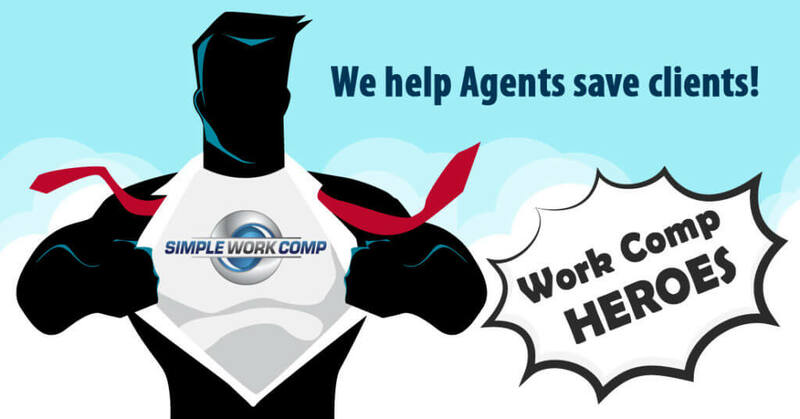 So without any major headaches (for the agent or his client), Simple Work Comp was able to help his client find the best coverage possible. If you are an insurance agent and could use help with clients needing comp or if you just have questions about workers’ comp insurance. We have over 80 years of combined workers’ comp experience and have pioneered the methods used today to save businesses on workers’ compensation insurance. High-Risk, hard-to-place, new ventures, non-renewals, and more.